Three years ago, I ran my first marathon barely breaking the 4:30 barrier. 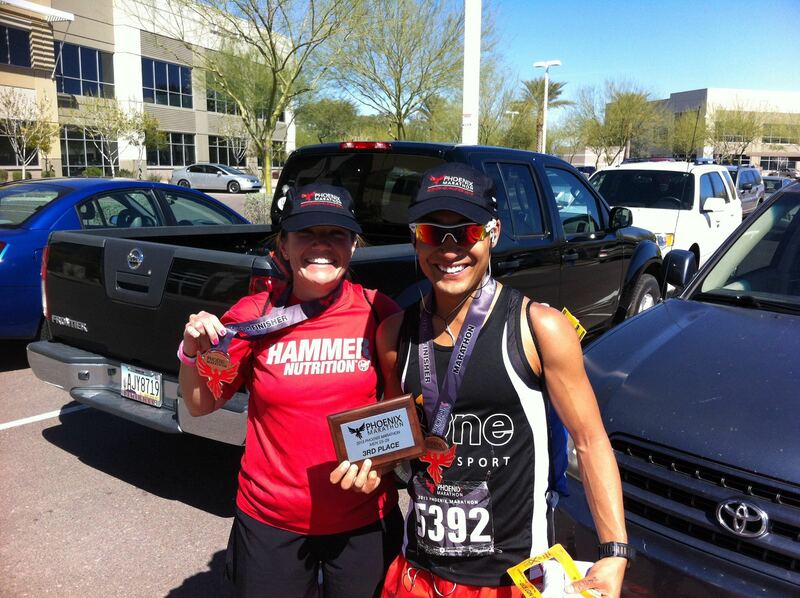 It was a huge accomplishment at the time just to finish and run 26.2 miles. It still is one of my proudest moments crossing the line at my first marathon. I’ve trained hard the past three years moving from the back-of-the-pack towards the front. I’ve been getting many messages asking how I’ve become one of the “fast guys.” I’ve learned that there are no shortcuts, no easy way to become faster, and improvements come gradually. It’s a mentality of wanting to improve day in and day out, cleaning up the diet, recovering properly, and having a well laid out training schedule built around priority races. I’m very passionate about everything I do, including endurance racing. I have an all-or-nothing personality– either I’m going to try to win and be the best I can be, or I’ll find another hobby. I know I can always fall back on hot dog eating contests – Asians own those competitions. I created my own training schedule. It consisted of one speed (track) day, one strength/hill day, and one long run a week. All other runs were easy, slow, recovery “filler runs”. I’ve also been swimming around 10,000 meters and riding 100-125 miles a week. With all the extra cross-training, I wanted to test if I could back down on overall run volume. My peak run weeks were only 50-55 miles. I strung together four solid weeks of long runs of 20-23 miles. Each long run consisted of 60-90 minutes at marathon or sub-marathon pace. I also got myself accustomed to negative splitting. 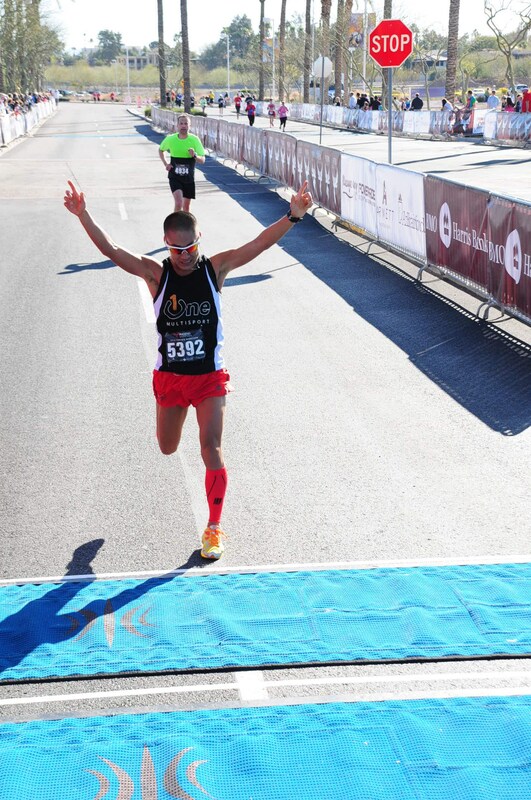 I laid out some goals for this race: (1) break 2:55, (2) negative split, (3) be the first OA Asian. I was rearry ready. The course has a net loss of 850 feet (450 feet gain, 1300 feet loss). To compare my other marathons, Boston has a net loss of 442 feet, Cali International has a net loss of 309 feet, and Rock and Roll Arizona has a net gain of 87 feet . 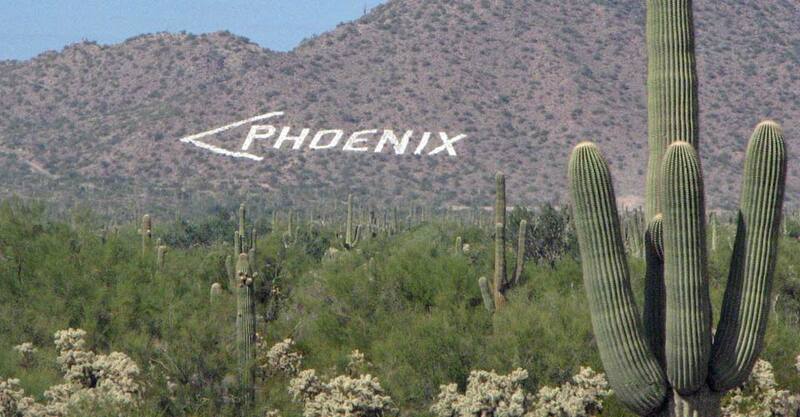 Tucson, the mother of all Arizona downhill marathons, has a net loss of 1,750 feet (900 feet more than Phoenix Marathon). 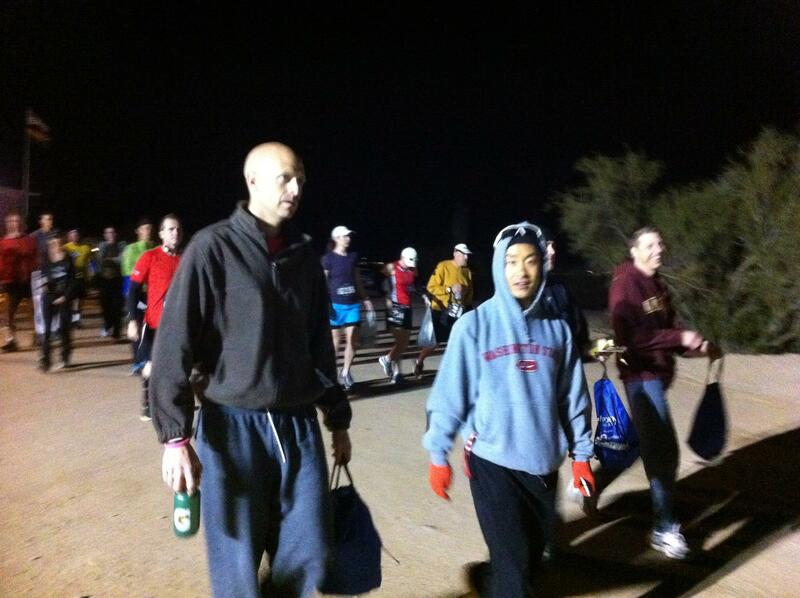 The course begins at Usery park in east Mesa. 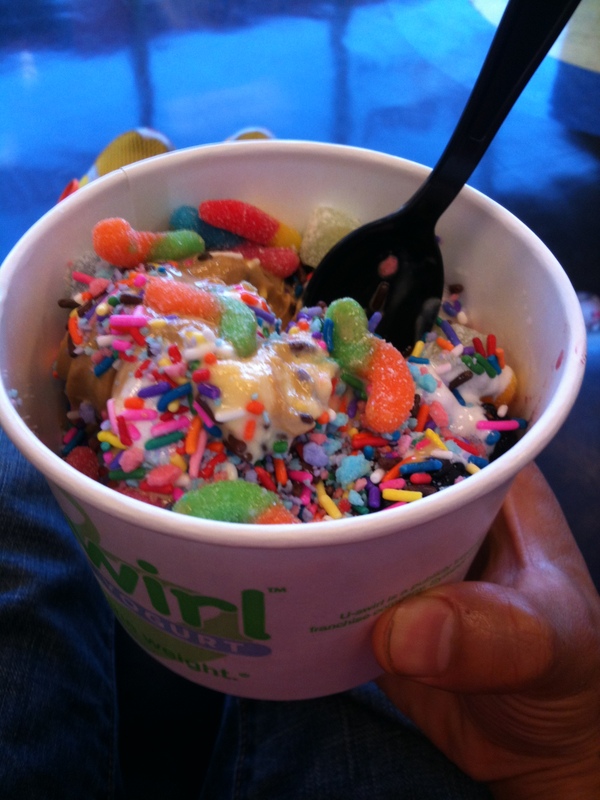 It immediately begins with a quad-buster– 450 feet of elevation loss in the first four miles. The only climb on the course is miles 4-6 through the hills of Las Sendas. After mile 6, it’s more steep descending (360 feet) until mile 10, when the course levels off. This course has PR written all over it. 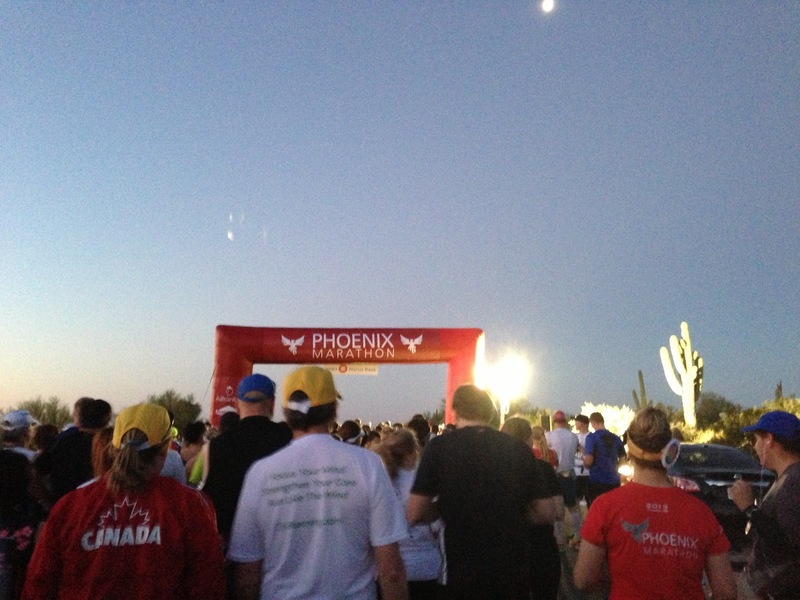 The marathon began at 6:30 A.M. 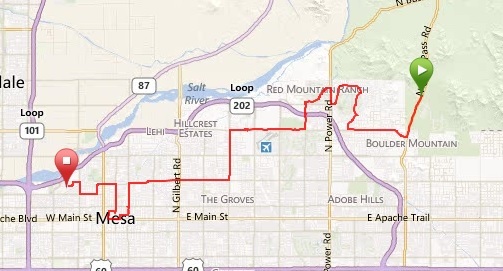 Since it was a point-to-point race, I drove to Mesa Riverview to get shuttled to Usery Park. This meant waking up at 3:45 A.M. and getting to the buses around 4:30 A.M. The bus ride to the start line in point-to-point races always seem like a looooooong way. 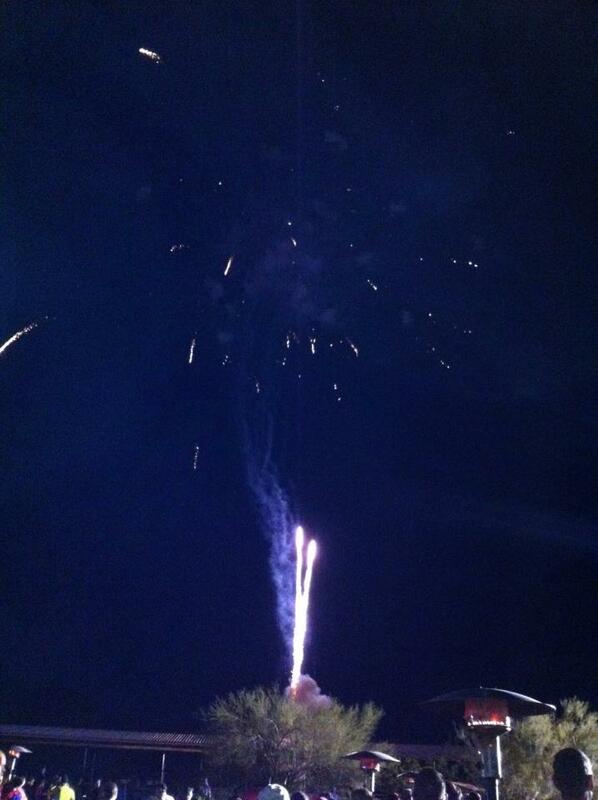 We were treated to a fireworks show during the National Anthem. Although nothing can replace the beautiful, soothing voice of our very own, Dan Cadriel, it was still a great way to get the party started. I consider myself a very calculated racer. I know my limits. From my past marathon experiences, I wasn’t going to be one of “those guys” who jumps out of the gates and crash and burns in the later miles. I’ve been there, done that. I was going to race smart. My initial goal was to hit 2:55, a 6:40 average pace. It was tough coming up with a pacing strategy, knowing that the steepest descent was the first four miles. I didn’t want to start too fast; at the same time, I needed to consider the “free speed” throughout the steepest section of the course. I did some research. Boston starts the same way; the steepest section is the first few miles of the race. I looked up Boston Marathon pacing strategies. I settled on an article and constructed my strategy– a 6:40 pace was my “magic number”. Knowing that the first four miles were downhill, I subtracted 15 seconds per mile from my goal pace (6:25). Then, I added 15 seconds (6:40), following the philosophy that you should always start out slow and negative split. Thus, 6:40 would be my starting pace for the first four miles. To account for the two mile climb, I added 15 seconds to my goal pace (6:55). Miles 6-20 would be 5-10 seconds faster than goal pace (6:30-6:35). Miles 21+ was reserved for letting the engines roar. Miles 21+: channel inner Linsey powers. 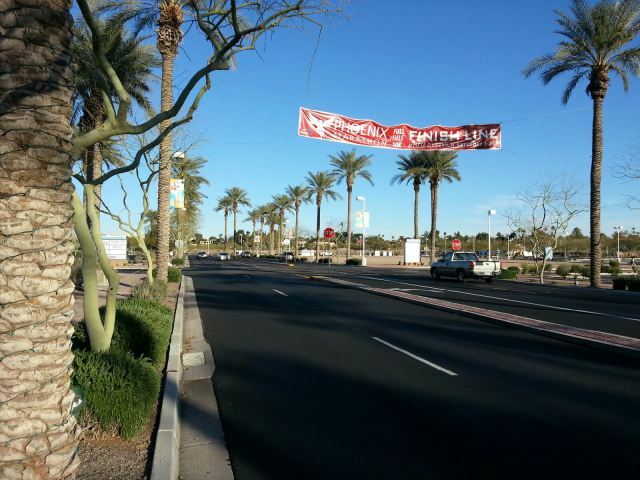 The infamous Phoenix sign on Usery- the starting point of the Phoenix Marathon. The gun went off, just as the sun was rising at 6:30 A.M. People took off, sprinting down Usery. It was tough not to go with them. I held back. Heart rate low. No labored breathing for the first four miles. I kept repeating to myself: FOLLOW THE PLAN. FOLLOW THE PLAN. FOLLOW THE PLAN. I fought every urge to chase people, but I behaved myself. I was still a little faster than I predicted, averaging a 6:35 pace for the first 4 miles. It was a steep descent and it seemed so easy. I knew the conservative approach would work to its advantage later in the race. Miles 5-6: I took the climb incredibly easy, averaging 6:53 and 6:57 each mile… embarrassingly slow. More people passed me. Mile 7: It was game time. I put on the sunglasses as I got to work. I dropped the pace to sub 6:30s. It’s funny seeing the people way up in front early on in a marathon that have no business being there. I began picking people off left and right. I was going fast… and having a blast. I consistently ran 6:25 miles for the next few miles. 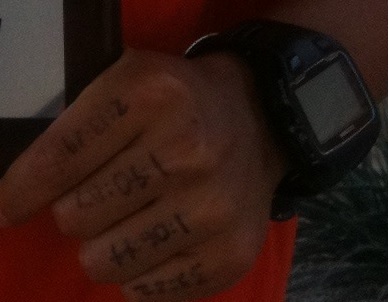 Then it dawned on me- looking at the 10 mile split on my index finger, I was 1:30 ahead of my goal finish. Should I aim for 2:50? I made the decision to increase the pace. I began hitting 6:15-6:20 miles. I saw my buddy, Erik Svans, at mile 12 spectating on his bike. He told me I looked like a ninja. I sure felt like one. I reached the 13.1 timing mat in 1:25:47. I was feeling incredibly fresh, passing people like they were standing still. I was 24th overall at the halfway point. I continued trucking along at a 6:15 pace. I looked at my finger for the 15 mile time check: 3 minutes ahead of schedule. Mentally and physically, I was still in good shape. It got a little hot as I used every aid station to splash cold water over my face. I made it a point to drink early on and not fall behind on hydration. I continued passing groups of runners. It felt so good. My patience was definitely paying off at this stage of the race. At mile 16.5, I crossed Linsey Road. I chuckled as I blew a kiss at the sign. Mile 20: My pace was starting to slow a little, as it came back to 6:30 minute miles. I did some quick math in my head. If I could maintain a 6:25-6:30 pace, I could go sub 2:50. Mile 23-26: The miles of truth in a marathon. I felt like dog poop. My heart rate was jacked and I forced myself to continue sipping and drenching myself with water at every aid station. Then, the weaving in and out of the huge herds of half marathon walkers– Ugggh. Some of of them were walking five deep, blocking the entire road! These walkers obviously saw the lead marathon runners flying past them. I have no problem with walkers, but please show some courtesy next time and walk on the side. I was too tired to say anything. My last four miles were 6:38, 6:45, 6:41, and 6:38. I lost the sub 2:50 in the last four miles as I couldn’t maintain pace. I tried to maintain good form, turnover, loose shoulders… nothing was working. It was a deep burn. I just couldn’t get back to running a sub 6:30 pace. Though, I knew I was gonna demolish my goal of 2:55. I made the turn on Bass Pro Drive off Alma School- just a quarter mile to the finish. I made a quick glance behind my shoulder and saw another full marathoner approaching. No one had passed me after mile six. I emptied the tank as I gave it everything I possibly had. This guy wasn’t going to pass me. I put my head down, gritted my teeth, and took one last glance. With 50 yards left, I still had a sizable gap on him. I knew I was in the clear. 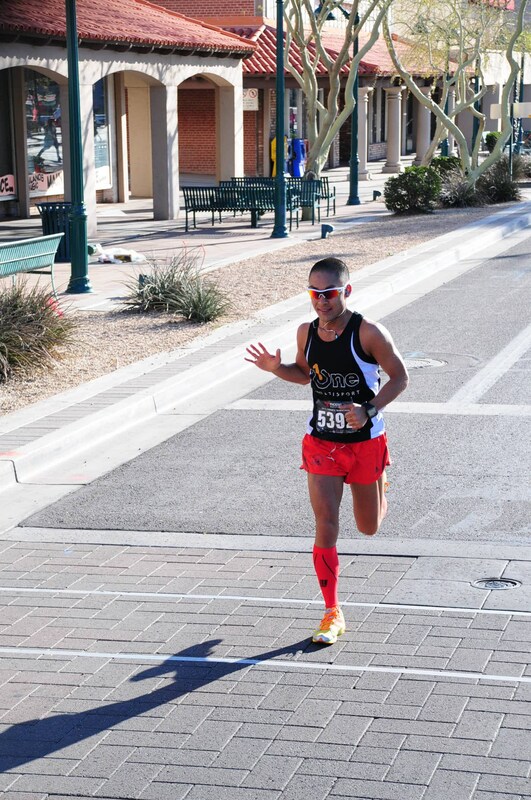 I crossed the line in 2:51:03– 15th overall (out of 1,279) and 3rd in my age group. I even reserved enough energy to crack a smile and raise my arms in the air. 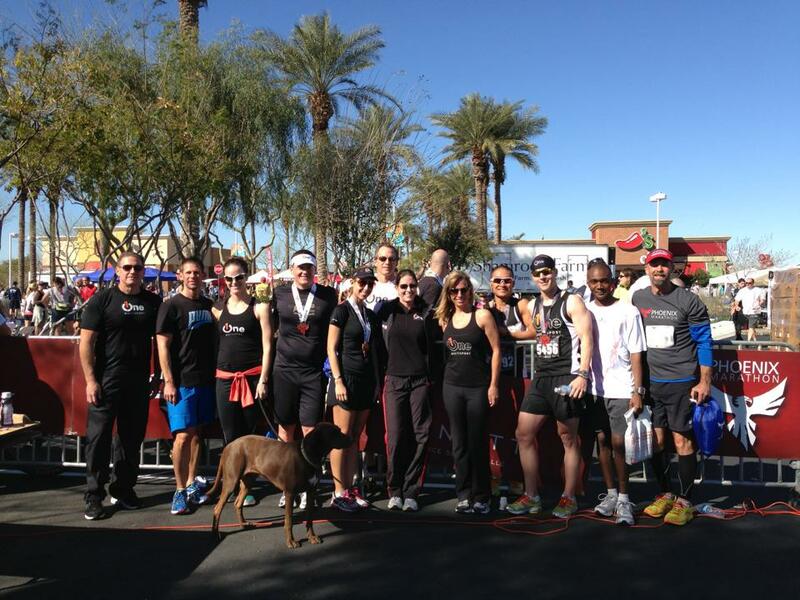 Special thanks to all the volunteers and race coordinators for putting on a great inaugural full marathon. It was very organized and I would highly recommend this race. The expo, shuttle service, pre- and post-race activities, and the race were stellar. Thank you! I got a post-race massage, loaded up on bread and gummy worms, and got my age group award from Hubert. Congrats to all my ONE teammates! And, I was first overall Asian. Seriously. I have wet eyeballs. You are amazing. Thank you for sharing. Always so motivational, Teri. Thanks!! That’s huge. Just, huge. I’m used to reading race recaps from people considerably slower than me, so it’s a bit strange to hear about the high 6s being “slow.” In fact, reading your post and imagining someone hitting a wall and still managing to churn out splits in the mid 6s strains comprehension. From 4:30 to 2:51 — that’s truly impressive. My range is much narrower (4:03 first marathon to 3:23 most recent one) but stories like yours give me confidence of one day nailing that BQ. Thanks for the comment! 3:23 isn’t far off… go get that BQ! I enjoyed your race report. It was really nice to meet you at the finish. You had a perfectly executed race. Way to negative split. This is an old post, but congrats none-the-less! 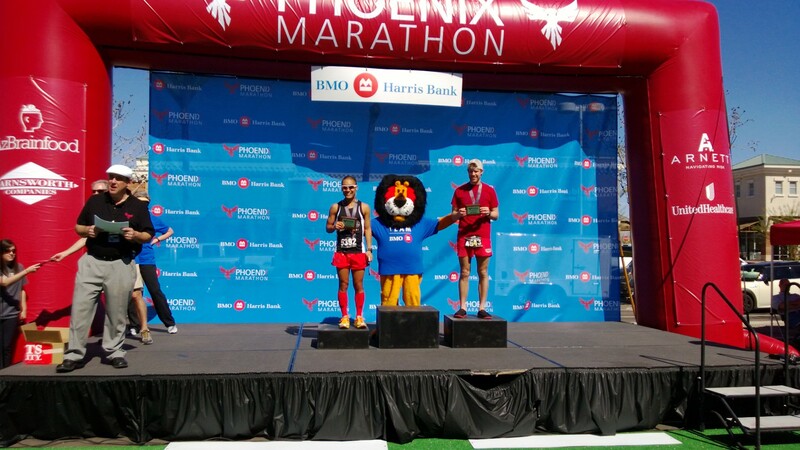 I was debating between Arizona Marathon and the Phoenix Marathon for bring, but may opt for this one now…..in part to your amazingly well written race report. Cheers to you and thanks for sharing, Speedy! I’ll be hoping for a 3:35 (Unless I hit that in Dec or Jan, in which case it’ll drop), but wow, 2:51 is amazing!